Important: Available once step 1. Initial Processing is done and both the Reflectance Map and the Index Map have been generated. Note: The Colored Index Maps are obtained by applying defined coloring rules to the Index Maps. Warning: If a Colored Index Map already exists for the selected Index, generating the new Colored Index Map will overwrite the existing one. 1. On the Menu bar, click View > Index Calculator. 2. (Optional) Change the number of Classes or how the Classes are defined. 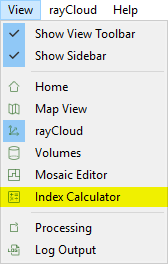 For more information: How to edit the Color Mapping in the Index Calculator. 3. In section 5. Export, click Export for exporting the Colored Index Map to the result folder. For information about the project folder structure: Project Folder Structure.